Let me just start off by saying, I do NOT believe in New Year’s Resolutions. I think everyone should strive to be a better person and work towards personal and professional goals on the reg. However, that being said, I always feel like I need some sort of a detox after the holidays. Every year I choose something to get rid of after that ball drops at midnight. I’m not talking big goals here people. Let’s be realistic. 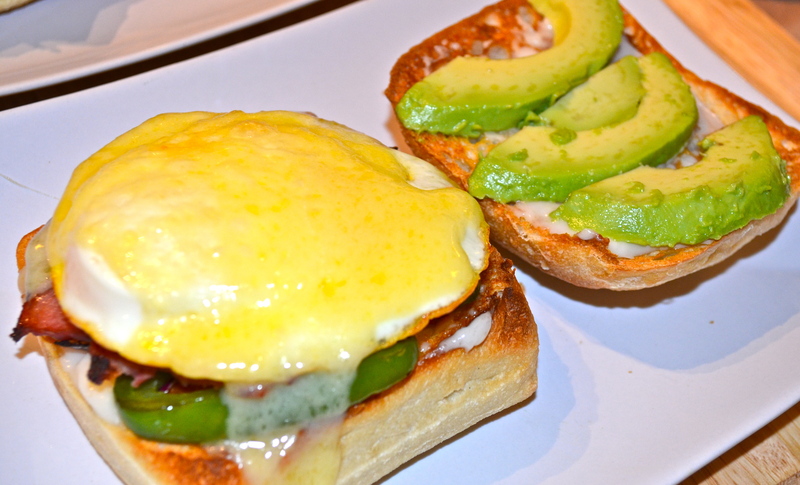 I have a food blog. I LOVE EATING. My goals are usually: avoid baked goods a couple weeks, don’t buy that bag of potato chips or peanut m&ms on your lunch break, eat healthier Monday-Thursday so I don’t feel guilty about my weekend gluttony. You know…just try and get back to the routine I had before Thanksgiving. This year we decided to avoid alcohol for 2 weeks. YES. 2 weeks. This may not seem like a challenge for most people, but when you live in a city where get-togethers revolve around happy hour deals and you are in your mid to late 20s, avoiding alcohol is difficult. I’m 3 days into it, and had to decline wine at dinner Friday night and a bloody mary at brunch yesterday morning. Temptation is everywhere. I wanted to set a realistic goal of 2 weeks, since I am going back home to Wisconsin mid-January and let’s be honest…reunion with family and friends in the Midwest… goes hand-in-hand with alcohol consumption. 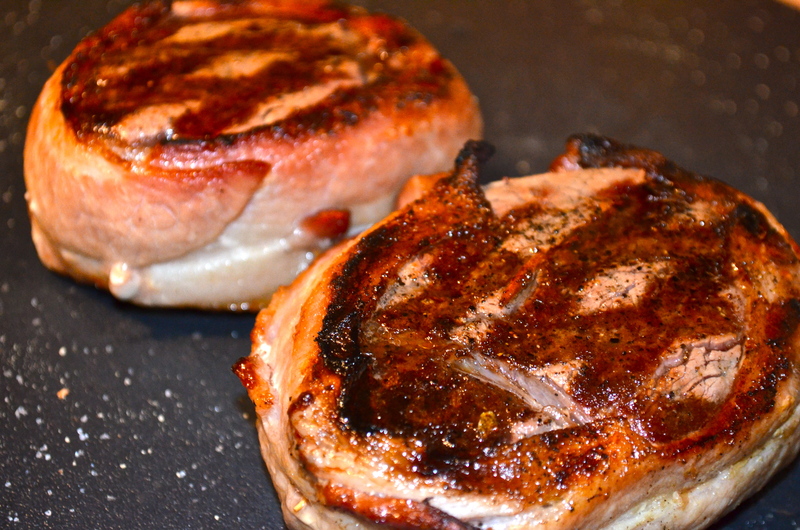 How does the bacon-wrapped filet mignon come into play? Well if I’m not drinking, I might as well eat like a queen :) Honestly, I would never order filet mignon at a restaurant because I do not want to pay a fortune for a piece of meat. This is still a pricier meal to make at home, but for less than $1o a person you get to enjoy steakhouse quality meat. What’s better than grilled steak? Wrapping that steak in bacon of course! I like my steak medium-rare so the cooking time below is reflective of that. You will need to grill a bit longer if you like your meat a bit more on the well-done side. Let the filets come to room temperature, by letting them rest for 30 minutes outside of the refrigerator. Meanwhile, soak the toothpicks in water. Clean your grill surface and preheat the grill to 475-500 F.
Using your tongs flip the filets over, close the grill lid, and cook 3 minutes. Then lift and turn the filets 90 degrees one last time, close the lid, and cook 3 minutes. 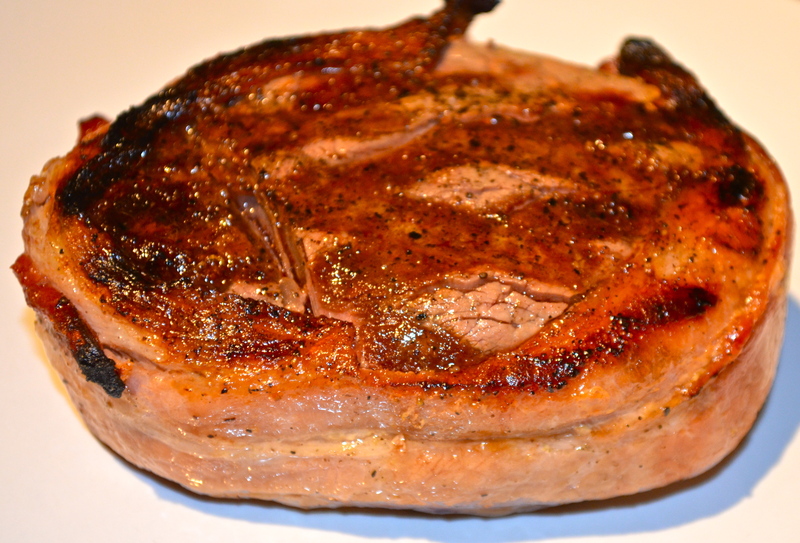 Remove the filets from the grill, tent with aluminum foil, allow to rest 10 minutes before serving. This will allow the juices to settle. After the meat has rested, remove the toothpicks, and serve warm. Note: when cooked for 6 minutes per side, as this recipe states, the filet will come out a perfect medium-rare. If you like your steak cooked more thoroughly you will need to grill longer per side. Apologizing in advance for this quick post. It’s been a whirl-wind of a weekend! On Friday we celebrated the 2-year anniversary of Andrew trekking across the world to visit me in South Africa (now that’s a story for a differed post). Saturday was dedicated to family and friends with a morning work out, brunch, dinner and a burlesque show (if you’re ever in Seattle you MUST check out Triple Door theater downtown). And today was all about errands, house-keeping, and Teek of course! 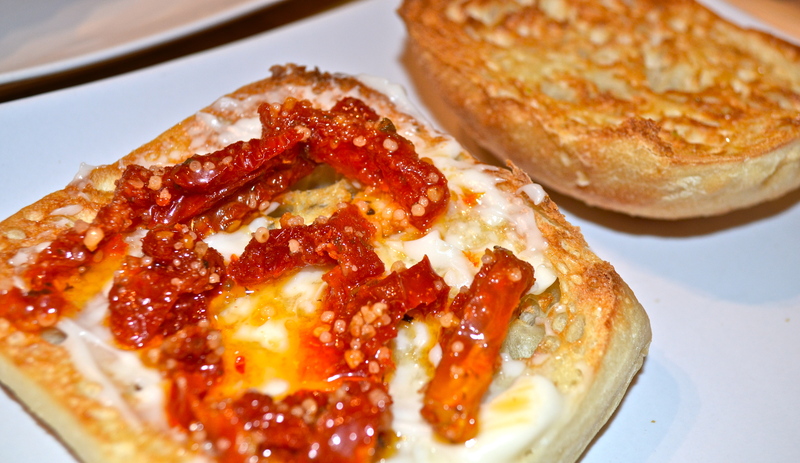 Fast-forward to this recipe. 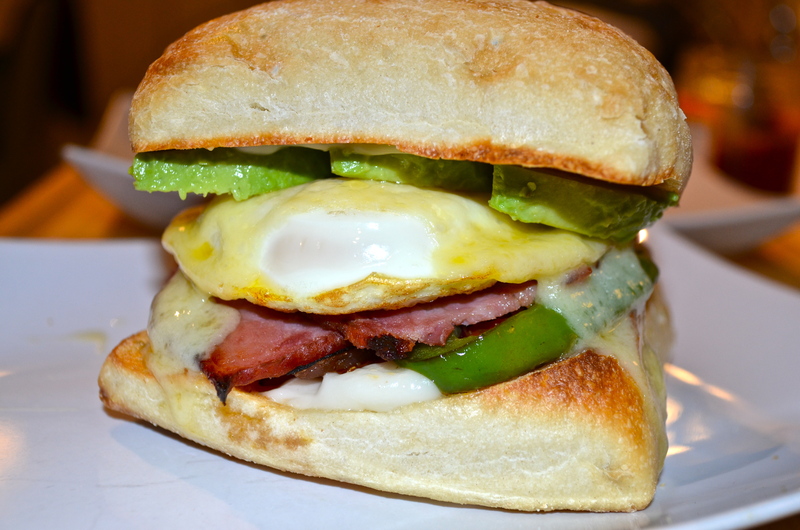 It’s quick, comforting, simple, yet has a complex flavor profile. 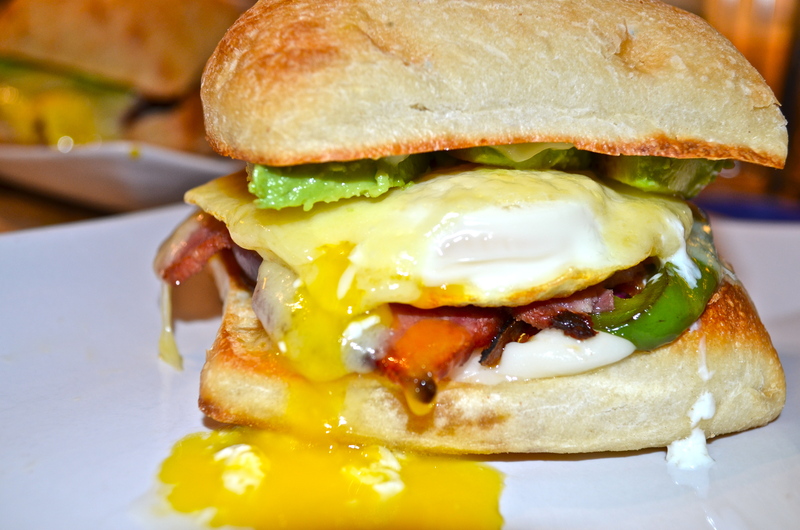 AND IT HAS BACON. Cook the bacon in a medium sauté pan according to instructions. Remove bacon from the pan and place on paper towel to absorb excess oil. Keep the reserved bacon fat in the pan. 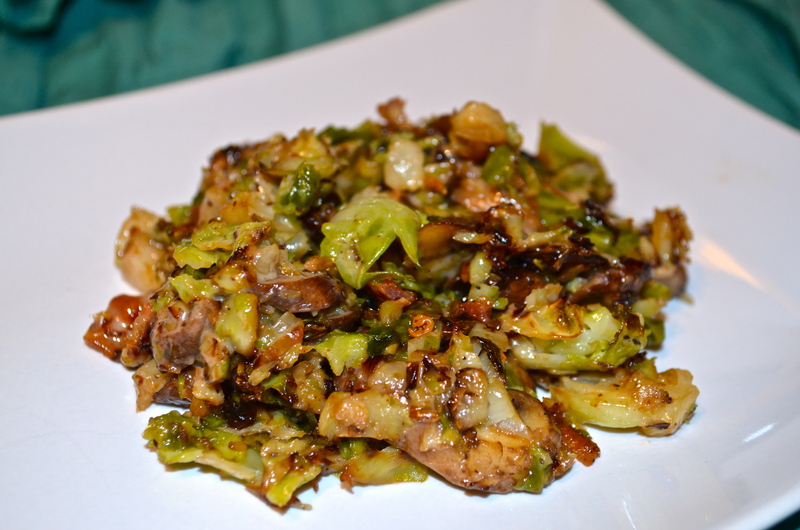 While the bacon is cooking, remove stems from brussels sprouts, slice in half, and rinse. Transfer to food processor and pulse until shredded. Leave some pieces of brussels sprouts larger. Transfer the sliced mushrooms to the sauté pan and cook for 2 minutes. 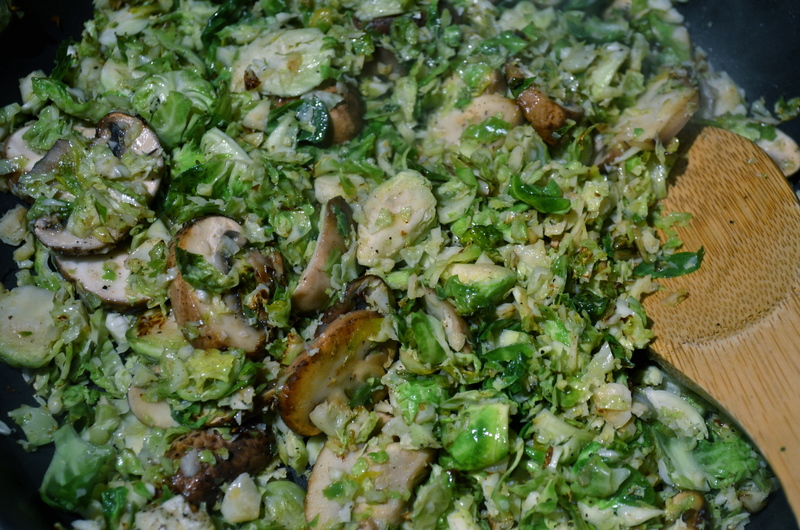 Then add the shredded brussels sprouts, continue cooking for 7-10 minutes over medium heat, stirring occasionally (the mushrooms should be cooked at this point). Remove pan from heat. Crumble the cooked bacon. 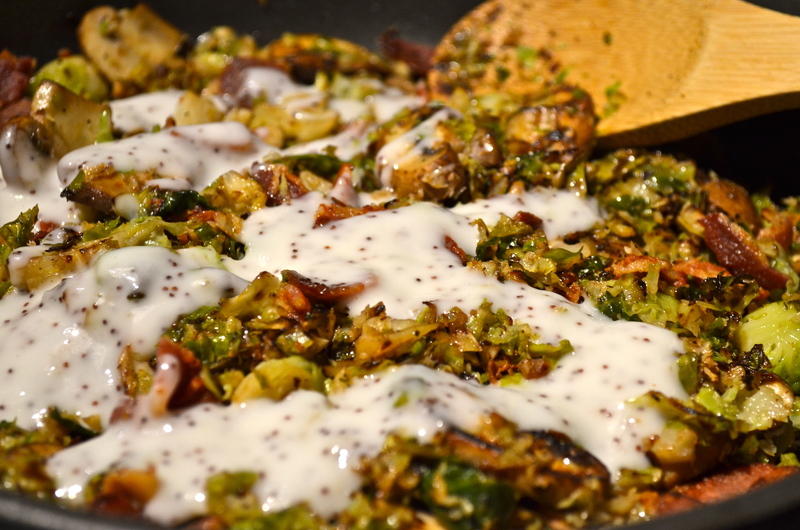 Add the bacon and poppy-seed dressing to the pan, ensure that vegetables are coated evenly in dressing. Serve warm. 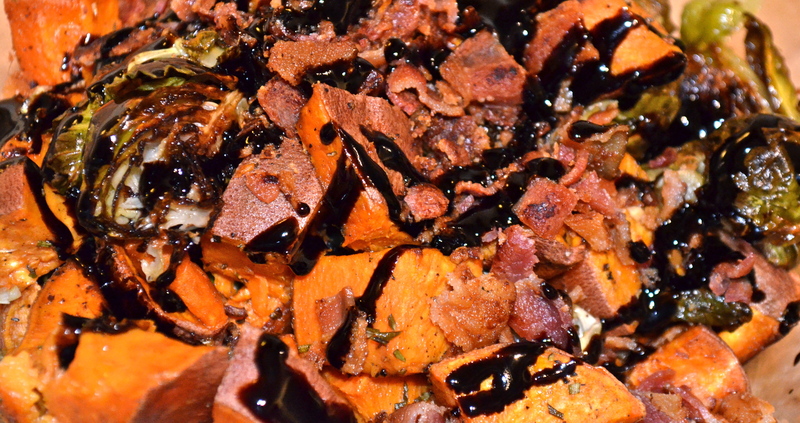 If you haven’t caught on by now I enjoy cooking with bacon, balsamic, and sweet potatoes. A co-worker of mine once told me that the trick to making the best potato salad is adding bacon grease. FYI adding bacon grease to anything, pretty much makes it the best “fill-in-the-blank” ever. My college town of Madison, WI even had an infamous bacon night at a local bar. Yes, we were served free, fried bacon with the purchase of a PBR tall boy. How Wisconsin can you get? The fact that it is fall in the PNW means even more yummy veggies that I can roast. 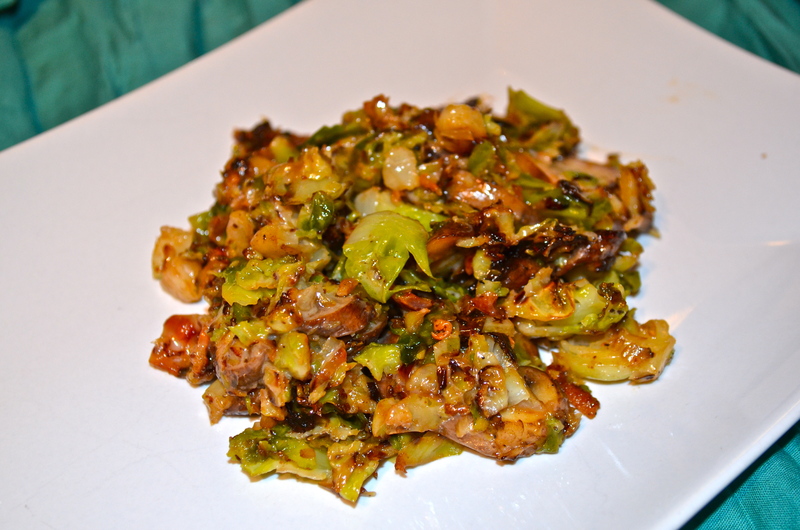 Brussels sprouts are a great vegetable that you can roast, steam, or pan fry. I prefer to roast my produce because a) the apartment smells fantastic b) I love when the vegetables get caramelized. Something I have never understood is why there is such a stigma for brussels sprouts? Pretty much every movie or tv show growing up always had kids begging not to eat brussels sprouts. 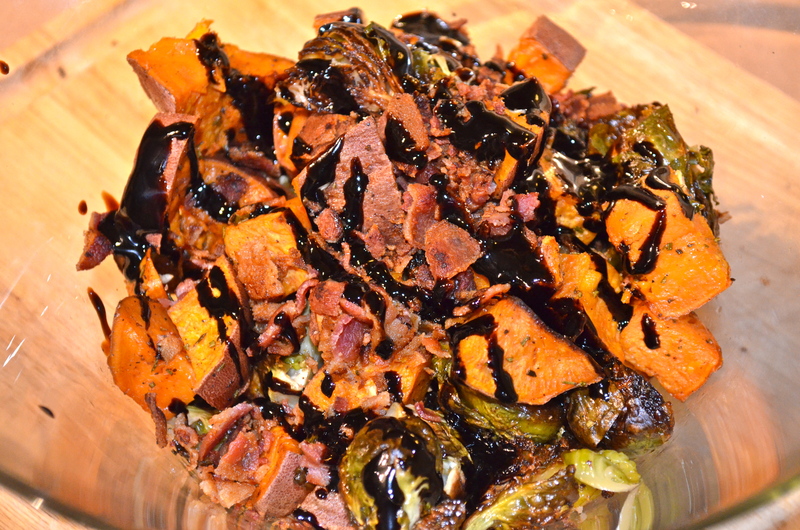 I bet if the brussels sprouts had been smothered in bacon grease, roasted, and drizzled with a balsamic glaze, those child actors from my youth would be BEGGING for a bite. 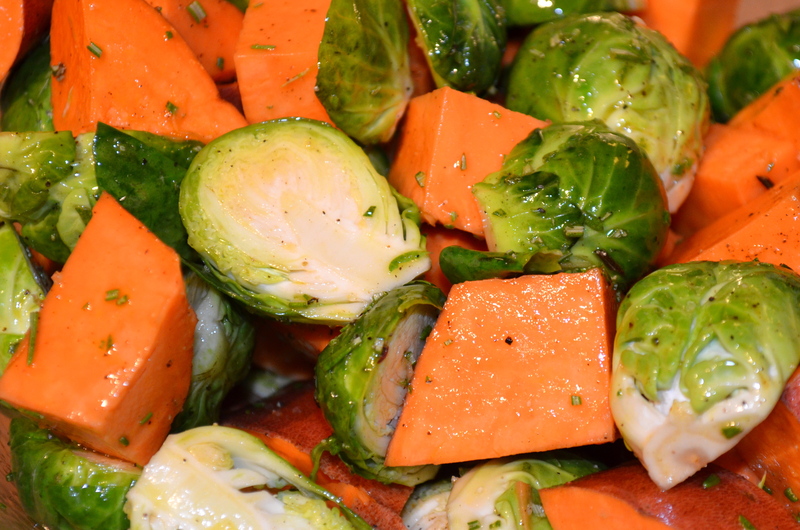 ADDED BONUS: This is an easy recipe because the sweet potatoes and brussels sprouts roast for the same duration. It’s a one pan dish essentially and since I always line my baking pans with aluminum foil…clean up is a breeze. Oh yeah the deal just got sweeter. After we devoured dinner, I had the idea that the next time I make this side it might be fun to add a burst of fresh, fruity flavor and sprinkle some pomegranate seeds into the mix. Perfect for the holiday season and can you imagine how pretty those pictures would be??? I will keep you all posted if I try this variation and what the outcome is! Preheat the oven to 425 F and line large baking pan with aluminum foil. Pan-fry bacon according to package. Set bacon aside on paper towel to absorb extra grease and reserve bacon grease that is in the pan. Prepare the veggies: rinse the brussels sprouts, remove the stem and cut in half lengthwise; rinse the sweet potato and cube into pieces similar in size to the brussels sprouts. Place veggies in a large mixing bowl. Add the bacon grease, coconut oil, rosemary, salt and pepper to the bowl. Mix until veggies are coated evenly. Transfer veggies to baking pan and roast for 15 minutes. Remove from oven flip brussels sprouts and potatoes over, sprinkle was garlic and continue roasting for an additional 15 minutes. Transfer roasted veggies to a serving bowl. 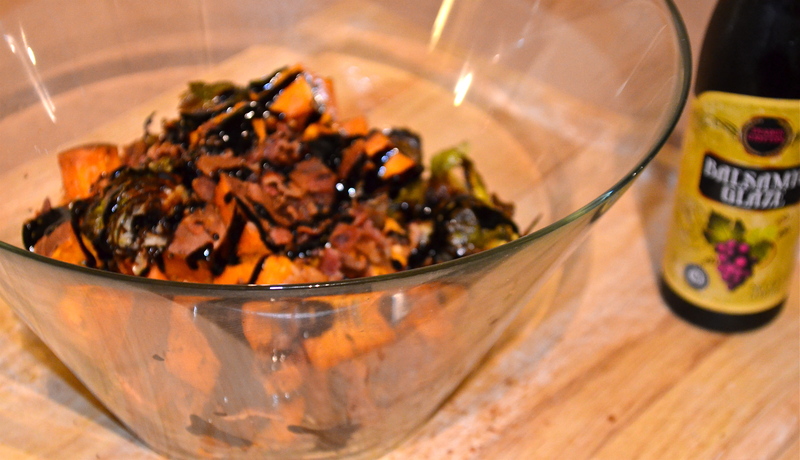 Chop bacon and sprinkle on top, then drizzle with balsamic glaze. Serve warm.